Beauty and perception of fermentation. Fermentation requires the presence of microorganisms. Only a few realize what an important role they play in our everyday life, especially, when it comes to food. Microbes themselves are invisible to the naked eye, but their activity can be observed in smell, taste, appearance, sound and foodtexture. 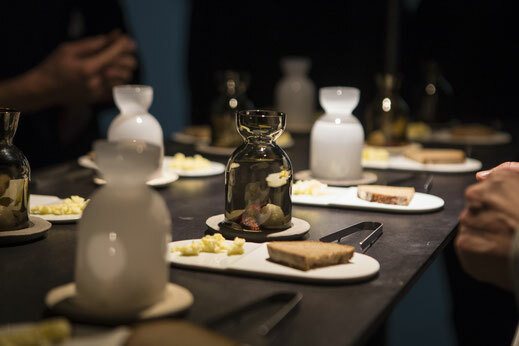 This sensual experience of fermentation processes formed the essential intention for designing a scenery for a culinary PopUp Event, including explorative tools. So, how then can this fascinating world of microbes - be successfully exhibited? Additionally, how does the context of the exhibition itself influence our visual perception of it? With the idea of creating a ‘cabinet of wonders’ - the growth of nano cellulose produced by kombucha cultures is staged with light. Long and narrow, flat glass cylinders showcase the process of a growing kombucha scoby at different phases. They are illuminated with light and the contrast of this, within the darker room - is dramatic and creates a sense of wonder. 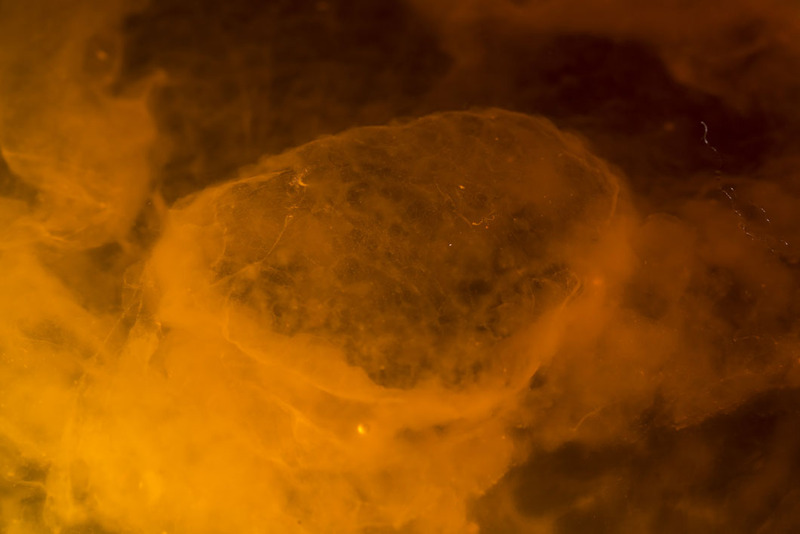 One growing Kombucha scoby is projected on the wall and so it is much bigger spatially. The fact that the snapshot of this phase is larger, makes the display immediately more eye-catching and draws attention to the fascinating multiplication process of the microbes in action. 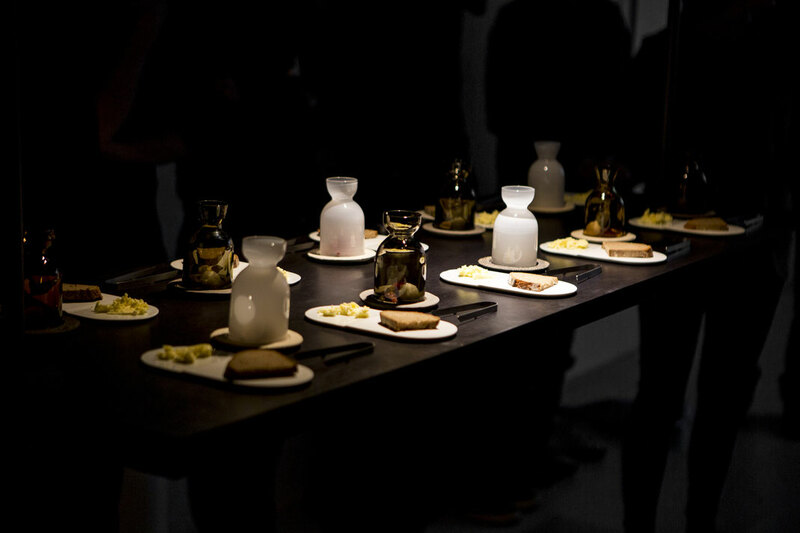 The „Sensorium“ collection of tools and tableware was designed with the intention of developing not just an object but an instrument of food exploration. 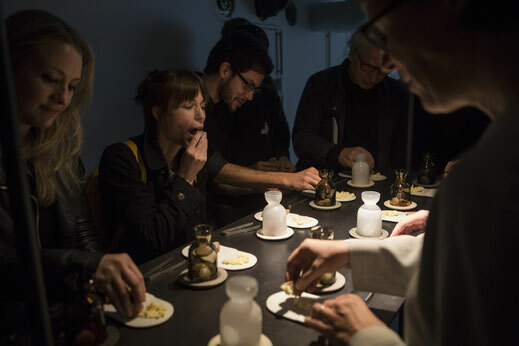 Visual sensations of food already reinforce expectations of how food will taste and what consistency to anticipate. Is it rough, soft, smooth? All objects were designed with special attention to the characteristics of fermented foods, like carbonation in drinks such as champagne and beer; or the sour scent of Sauerkraut and Kimchi. An open cloche to smell, tweezers to sense and glasses to magnify and observe. Tumblers: January 2017 issue of Wallpaper* (W*214), Online.